The first all encompassing vision of world-wide redemption, universal peace and true harmony among nations is attributed to the great prophet Isaiah. God chose him and all the other prophets recorded in the Bible to reveal a divine message regarding the ultimate potential and destiny of mankind. These words echo the loftiest dreams and aspirations of all peoples and have profoundly influenced thinkers, writers and leaders in every generation. In fact, the words of Isaiah (2:4) - “…and they shall beat their swords into plowshares and their spears into pruning hooks; nation shall not lift up sword against nation, neither shall they learn war anymore” - are prominently inscribed near the entrance of the United Nations. It is not surprising then that the symbol of light plays such an important part in so many of these prophesies, as universal redemption is envisioned as a great and permanent revelation of God’s light. For the individual as well, personal redemption is associated with the revelation of light and freedom from darkness. In the first chapter we mentioned the central theme of Israel being a “light unto the nations” and its importance in the collective Jewish consciousness throughout the ages. For according to all the prophets, Israel plays a critical role in the unfolding of the final redemption and the messianic era. The Jewish preoccupation with light in its rituals, customs, laws and teachings, especially of the mystical nature, is indicative of both the fascination with light and its integration into Jewish consciousness. The desired result is to inculcate and prepare the individual Jew and the entire people to fulfill their mission on behalf of the whole world. From the moment of the primordial “breaking of the vessels” when the divine light could not be contained, the progression of the worlds and human consciousness has been directed towards a time of rectification when this exalted light will be able to be contained, integrated and unified in man’s consciousness. In the terminology of Kabbalah, we need to make ourselves into proper vessels, transparent and pure, in order that the light of God may shine into us, and from us. Similar to how the sefirot, the channels of divine emanation, serve as both vessel and light, we as well need to make ourselves worthy of emanating God’s light into the world. There is a deep parable associated with olive oil as the means to anoint the ultimate leader of the Jewish people and all mankind. The olive in order to give forth its oil must be beaten and crushed. Therefore the Jewish people are compared by the prophets to olives, and its history is one episode after another of being beaten and crushed by the nations of the world. Yet, like the olive, the more it is beaten the more oil it gives forth. This oil has not only enriched Jewish life through the ages, but has had a profound and pervasive influence on virtually every area of human thought and achievement. 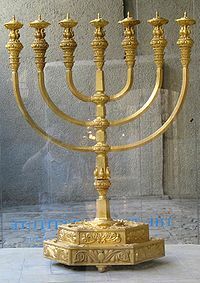 The miracle of Chanukah is that the oil, enough for but one day, burned eight days. Yet on an even deeper level there is the hidden “miracle” of how a physical fruit, turned into liquid, burns at all. One time right before Shabbat it was discovered that vinegar had been put in the oil lamps. Rebbe Chanina Ben Dosa exclaimed that the same God who makes oil burn can make vinegar burn as well - and it did! (Taanit 25a). Olive oil in allegorical terms represents a profound secret: that from physical matter leaps forth light. In relation to what we learned in the chapter on light and science this is actually no allegory; matter is energy, and they are both just different degrees of “thickened light.” What is true of olive oil is in effect true of all things. At the most common denominator, all that exists is actually the light of God. This profound understanding of physical and spiritual reality is intimately bound up with the Mashiach and his task in the world. For the Mashiach will initiate an irreversible process and sea-change of human consciousness. At that time all mankind will perceive the divine unity behind all reality, and the consummate union between the physical and spiritual realms. This idea is symbolized in an intriguing commentary on the verse: “And Moses took his wife and his sons and put them on a donkey and he returned to the land of Egypt…” (Exodus 4:20). Rashi comments that this is no ordinary donkey, rather it is the same donkey that Abraham saddled before the binding of Isaac, and it is the same donkey that the Mashiach will ride upon in the future. Obviously this donkey is not thousands of years old! Rather it symbolizes an idea that has gone through a number of progressions. Rabbi Yitzchak Ginsburgh explains that the letters for donkey (חמור) are the same as for “physicality” or “materiality" (חומר). The mastering and transformation of the physical in the service of the spiritual is the ongoing mission of man and especially the Jewish people. Abraham symbolically began the process by saddling the donkey, while Moses went further by placing his wife and children on the donkey. The Mashiach will complete the process by riding on the donkey himself, symbolizing the mastery of the material in the service of the spiritual. It is taught that the “first redeemer will be the last redeemer,” alluding to the connection between the souls of Moses and Mashiach (Shemot Rabbah 4:2). The first two letters of both names are actually the same (משה-משיח), and their basic mission of leading people from slavery to freedom and from exile to redemption, through the revelation of God’s light and message, will also be the same. Moses was born surrounded by light, he taught the Torah which is called light, and from the time he came down from Mount Sinai he radiated light all the rest of his days. The Mashiach will likewise radiate the light of Torah and God, first to the Jewish people and then the entire world. The expression of joy is very connected to the Mashiach, for when changing the order of the four letters of Mashiach (משיח( it spells “he will be joyous” ) ישמח). Joy is associated with light in many verses as discussed above. The soul of the Mashiach, like his prototypical ancestor King David, will have the ability to facilitate and draw others into a state of light and joy beyond all boundaries, yet expressed within the defined limits of this world. The secret of drawing infinite light into finite vessels was the theme of an historic talk about what was needed to bring the Mashiach, given by Rabbi Menachem Mendel Schneersohn. This concept is referred to in Kabbalah as orot d’tohu b’kalim d’tikun: taking the lights of the world of tohu, the world that shattered in the “breaking of the vessels” and integrating them into the vessels of the present state of the world of rectification. The word tohu, is sometimes translated as “confusion,” but the confusion was not in the essence of the light of this primordial world, rather in the damage caused by the inability of the immature vessels to contain such a powerful and pure, divine light. Therefore, he explained, that in order to draw the Messianic days closer it is incumbent upon us to create proper vessels in this world to hold such powerful and holy light, for the new reality to be inaugurated by the Mashiach will entail a powerful revelation of divine light. The more we are able to make vessels for this light, the more we draw the future into the present, enabling the energy of the Messianic era to be revealed. Each day in many versions of the morning prayers we add the following plea: “Let a new light shine on Zion and may we soon merit its light.” The new light referred to indicates an entirely new revelation of Godly light in the world, not just quantitatively, but even more so, qualitatively. According to Kabbalah and Chassidut this new light will emanate from the very essence of God, a revelation beyond that of transcendent and immanent divine light, as discussed previously. Throughout this book we have attempted to reveal the divine paradox inherent in the nature of both physical and spiritual light and in the existential reality of creation itself. In the very essence of God, where all paradox is seen to be in fact no paradox at all, there exists a state of total unity. It is only from our limited perspective that opposites seem to be irreconcilable. The new light, the revelation of God’s essence, will reveal the inherent unity of all reality. Along with direct revelation of this new light of God, the Mashiach will expound upon and reveal an entirely new dimension of the Torah. In as much as Torah is the explicit revelation of God’s will, a new manifestation of divine light will naturally be accompanied by a new revelation in our understanding of the Torah. For this reason it is written in the Zohar that on the merit of learning the inner dimensions of the Torah, redemption will come to the world. Similar to how expressions of true and pure joy draw the future into the present, so too, learning the deepest secrets of Torah reveals a future light even now in the present. As the world prepares itself for the approaching Messianic era it is not surprising that there has been an explosion of interest in Kabbalah, among Jews and non-Jews alike. As the Zohar predicted, the final redemption is intrinsically linked to the revelation of the inner dimensions of the Torah. We learned previously how light exhibits the mystical quality of transcending time. All activities that bring us into contact with divine light facilitate redemptive energy for not only an individual, but that energy once introduced into the world has a way of producing more light in ways we can barely understand. This light transcends time and can not only alter the present but can mysteriously change the past as well. In this book we have touched briefly upon many of these activities, such as meditation, prayer, study of Torah, the fulfillment of mitzvot, redeeming sparks of light and rectifying the world around us, all the while maintaining an attitude of joy, healing and love. The light of God is all encompassing and deep within the soul, and is revealed in every point of time and space. Its manifestations are as infinite as is the source of the light. The more we experience and integrate divine light, the more our consciousness and our very bodies become a vessel for this light. Ultimately, by unifying ourselves with this light we become a true image of God and thus fulfill the Creator’s purpose in creation. May the entire world merit the appearance of this new light, and the experience of bliss, peace and harmony that will be revealed at that time. May it be soon and in our days. Reb Avraham,, excellant and hopeful,, may it come true today!